Ethan has been to my Aunt Karen's pool three times so far this summer. The first time he went, he was a true babe in arms--that is, he never left my or Shane's side for a moment. On time #2, he got a quite a bit braver, and was willing to swim (with his swimmies, of course) off from us a couple of feet. It was pretty astounding for me to see, even though all of my boys have taken well to the water early, this 18 month old child just floating, balancing in the water all by himself. However, I could absolutely NOT believe my eyes on trip #3. Is that crazy, or WHAT?! how cute! Gavin would just go jumping off the side like that when he was a babe... no float or anything. He's still our little dare devil. holy cow dev! he is such a big boy in the pool! Luke doesn't care so much for the water. he is just now starting to blow bubbles in the pool and that's about it. we will have to practice now. I tried the floaties with him but he looked like he was too heavy for them? don't know. but your boys are doing great!!!! okay seriously, could our boys be any more alike...carter was doing that exact thing, only off the diving board because he daddy let him. it is never ending now. 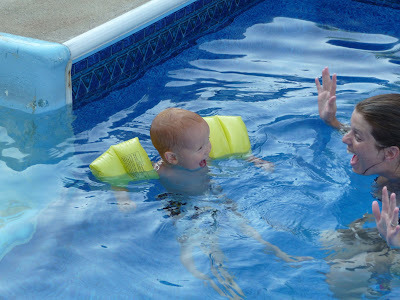 our only trouble is finding arm floaties, we have now switched to a life jacket, so he goes under but pops quickly up. they are crazy and make momma nervous! that is amazing, Devin. I need to get Lauren some floaties and see what she does. We're about to head to vacation in W. Virginia and it would be great if she was a little more independent in the pool. Wow, that's fun! That is absolutely CRAZY!! How adorable. My three start out HATING the water, then at age 4 start liking it...ughhh! Anyways, how cute and loved the video and pictures! Send the water love our way!!! (I know I don't have to tell you this,keep a HUGE eye on him now that he LOVES that water I saved my twin brothers lives when they were almost 2 at my aunts pool, they both jumped in the deep end with NO swimmies and thought they would just jump right in, no one was around except me and I was 12) Thank you Lord! Hope this didn't scare you or anything, totally didn't mean that!! =) Just a proud sisterly moment!! That is just crazy! Brody hated the water earlier this summer, he is finally cool with it except he still hates the sand which makes going to my parents beach hard! Friday we went to a birthday party and Brody was jumping in and going down their waterslide! I think Ethan has much more gusto than Brody though. 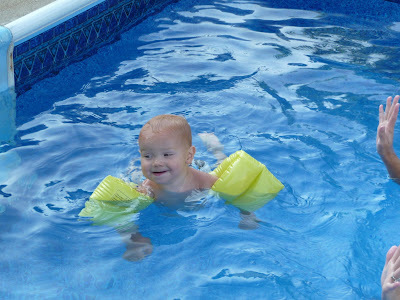 I am impressed with just using the swimmies and the floating!! Brody uses a lifevest AND swimmies!! Granted I started that way when he did not like it so I was trying to keep him really afloat, maybe I should try him with less. OH MY GOODNESS! What a brave boy! Puckey had to crawl into my lap to watch the boys playing in the pool...ha ha ha She'd sit here all day watching "the boys"
Yesterday, Puckey was in our little pool and said, "I want to swim underwater" and proceeded to just go under. I freaked out and grabbed her!! You WILL have to watch even more closely now, though - my Bubber went off the end of the dock into the lake at my ex in-laws when he was not yet 2. After that incident, the "law" was made that no kids were allowed in the backyard without life jackets on. Bug jumped into the pool at her great aunt's house once. Yeah, kids and water can be fun, but also a little scary! My parents have a pool and it scares me to death to have the boys around it...you're little guy is a champ in the pool though! What great pictures! You have a precious family! I found your link on MCKMama's blog and had to stop in and say hello to another Devin. It's my name too and spelled the RIGHT way just like mine. LOL!